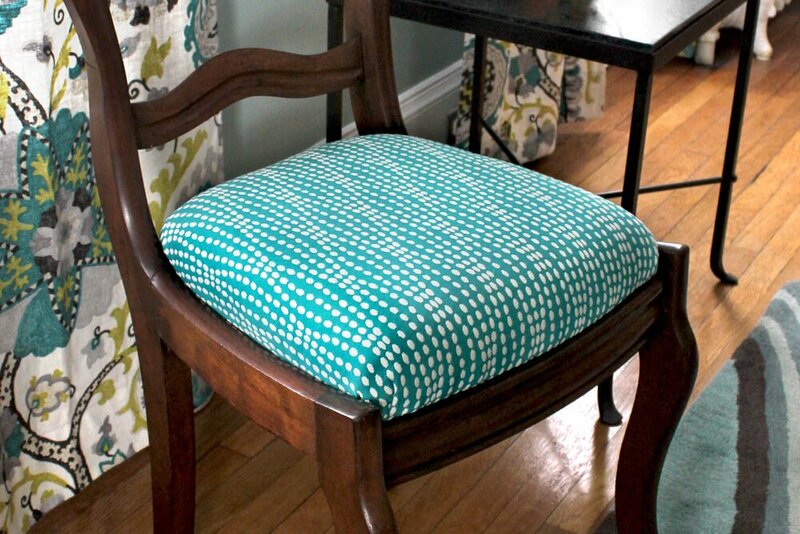 I’m going to show you how to give your dining chairs a fresh look by reupholstering the seat cushion. 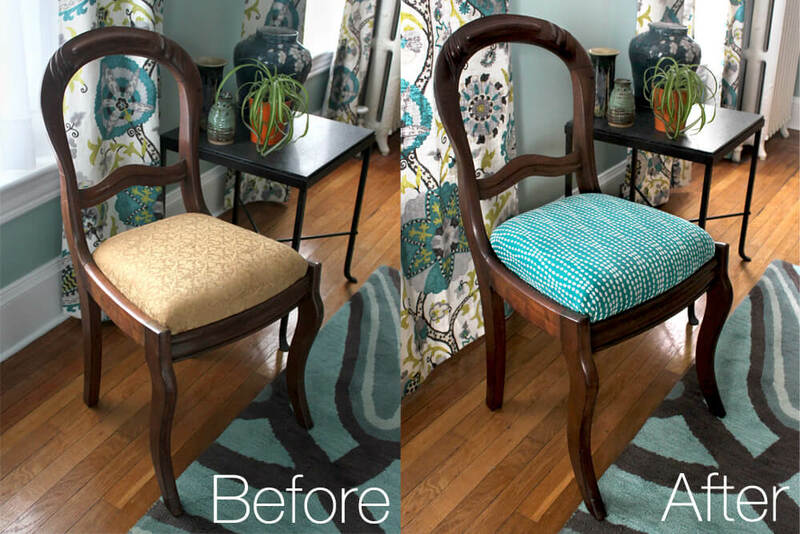 Many dining chairs have a cushion that can be easily detached, which makes reupholstering a simple project. 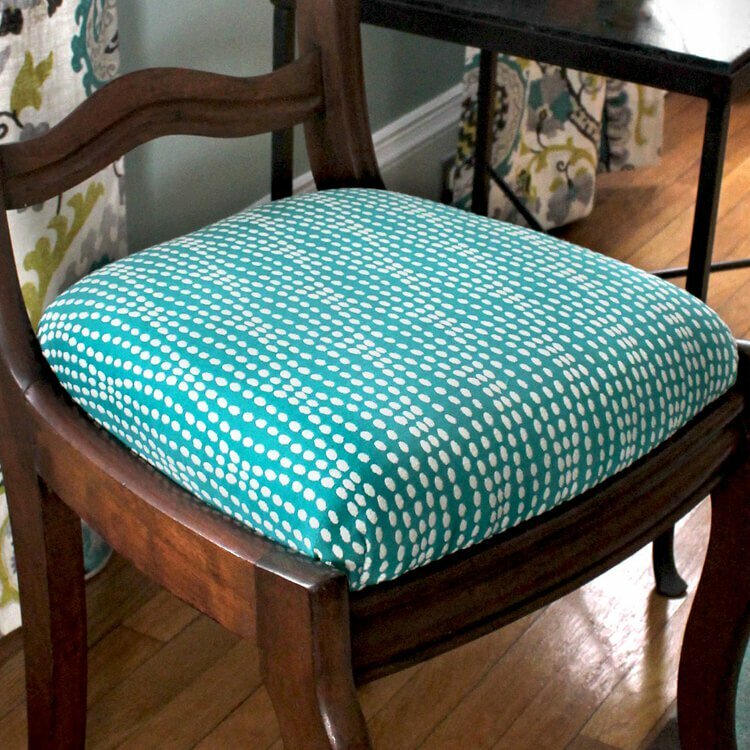 When choosing a fabric for you chair, keep in mind that it doesn’t necessarily have to be a heavy upholstery fabric like this. 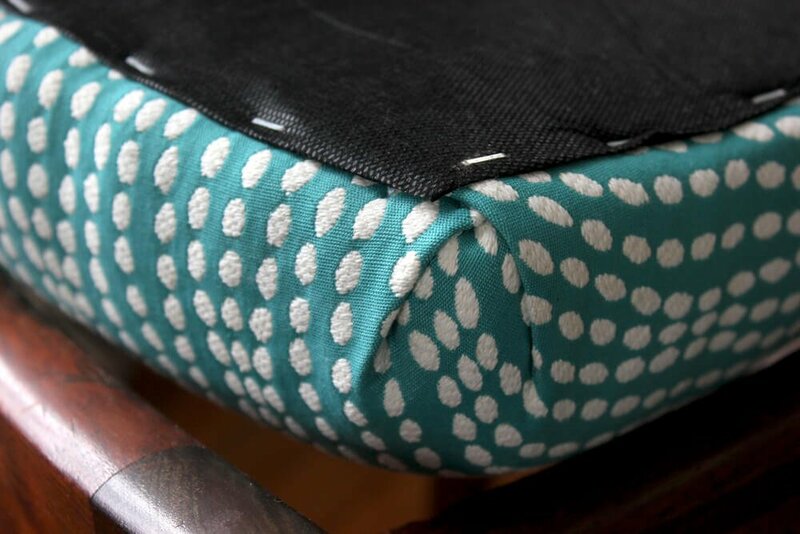 You can also use a medium weight drapery fabric, especially if the chair isn’t going to be heavily used. 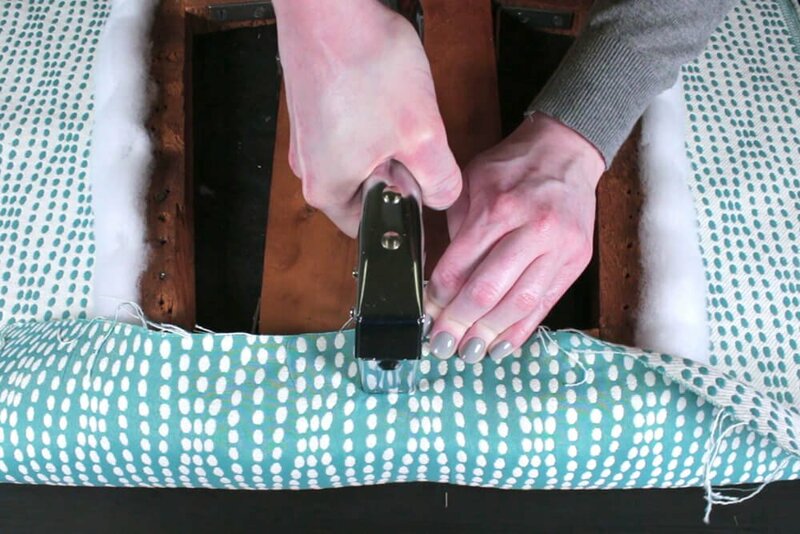 And you can always reupholster it any time you want. Knife Edge Dressmaker's Shears - 8"
First take off the cushion. It may be screwed in to the bottom. Take note of the way the corners are folded so you can recreate these pleats later. 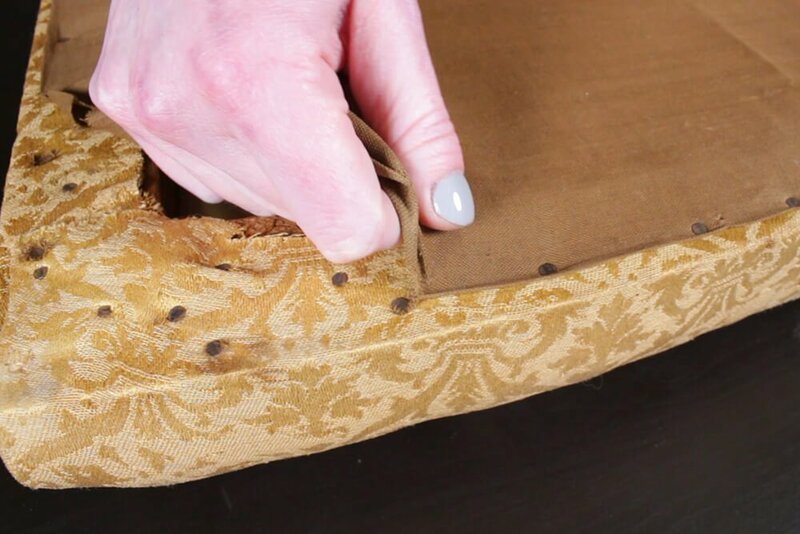 Turn the cushion over and detach the dust cover. 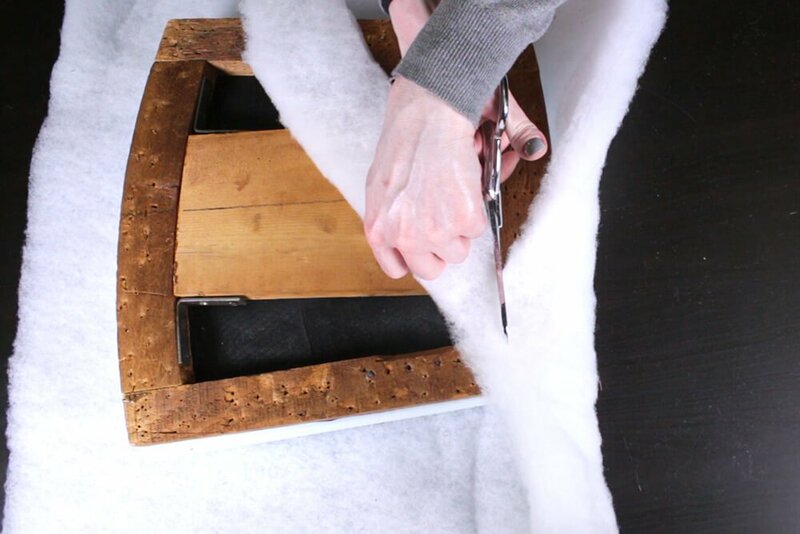 Remove all the staples or tacks that are attaching the dust cover and upholstery fabric, I’m using a C.S. Osborne Combination Tool to do this. 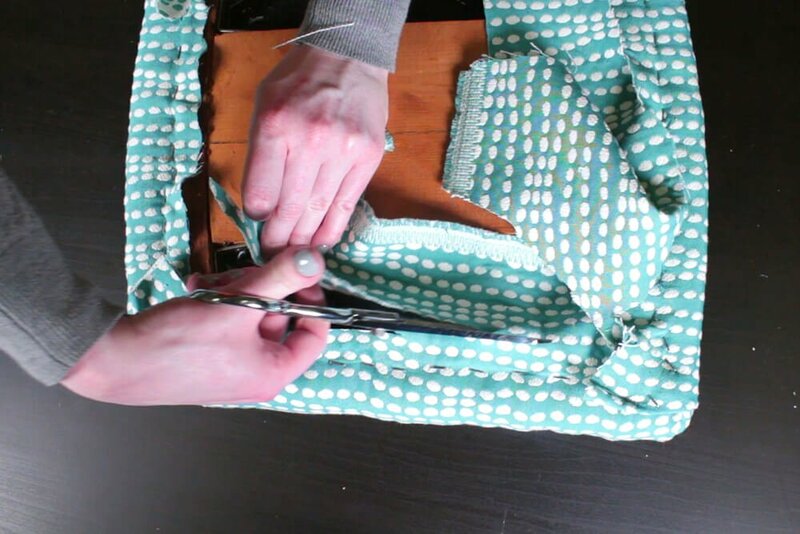 Continue to take off any other layers of fabric and remove all the tacks or staples. 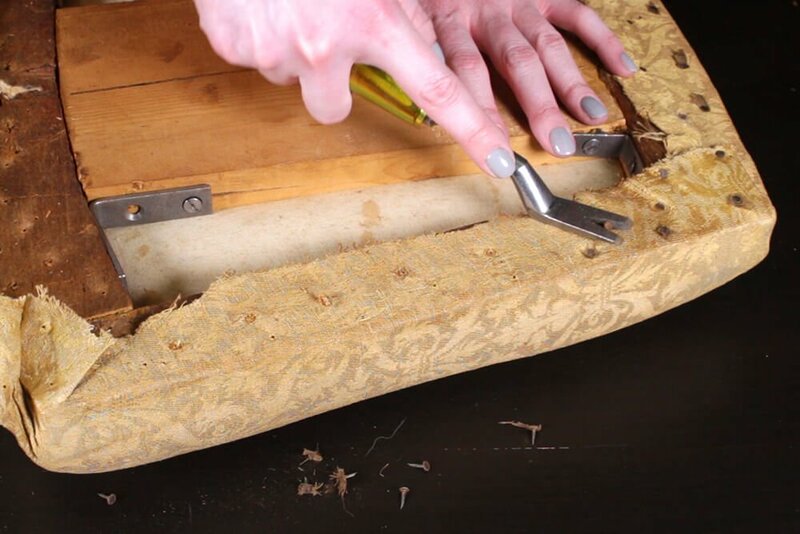 If your chair is newer, you may not have to replace the cushion, but this turn of the century chair has a cushion made up of straw and batting, so I’m going to replace it with foam. 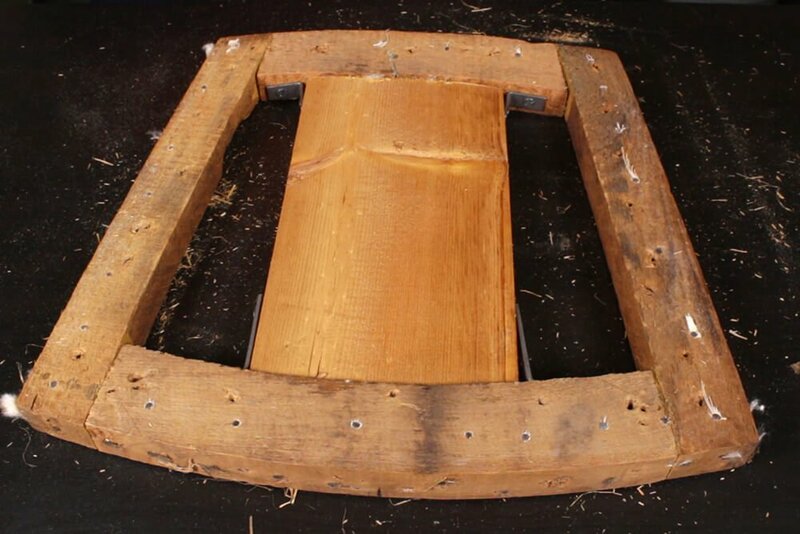 Strip the seat down to the wooden frame if you’re adding new foam. 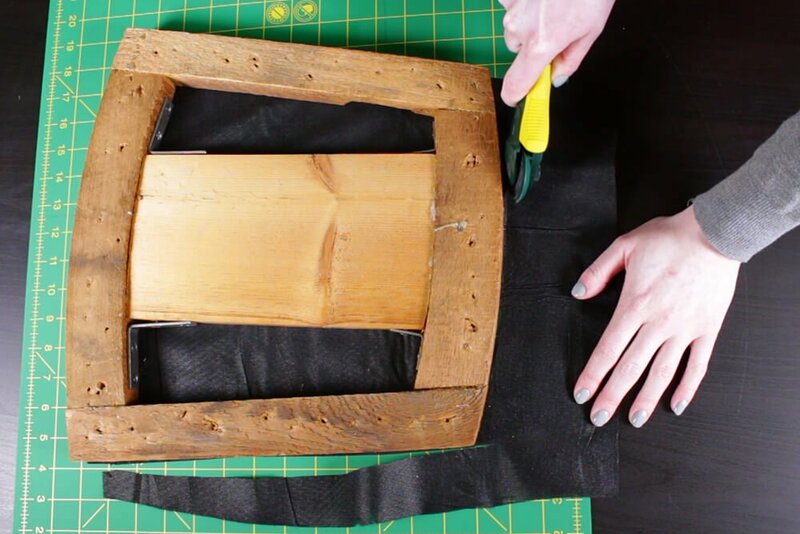 Your chair may have webbing instead, or a solid plywood base. 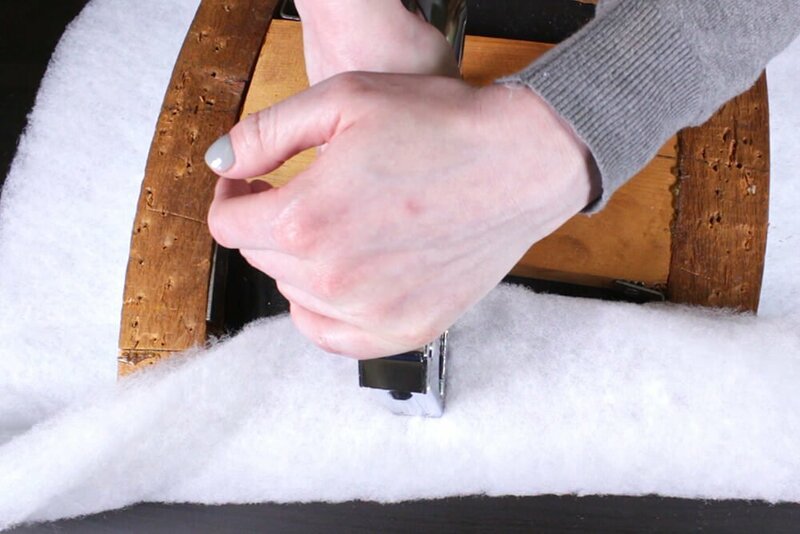 For this chair, I’m attaching a piece of the cambric below the foam so it doesn’t sag. 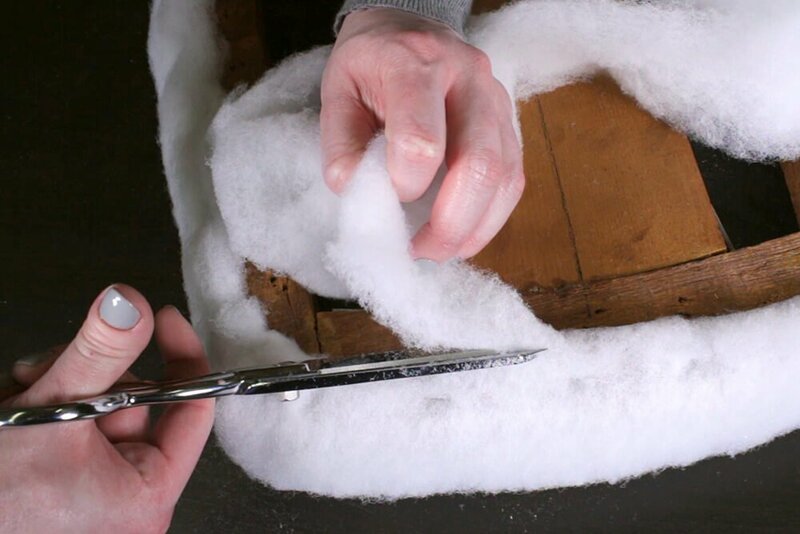 You can cut off the top edges of the foam to round the sides a little. 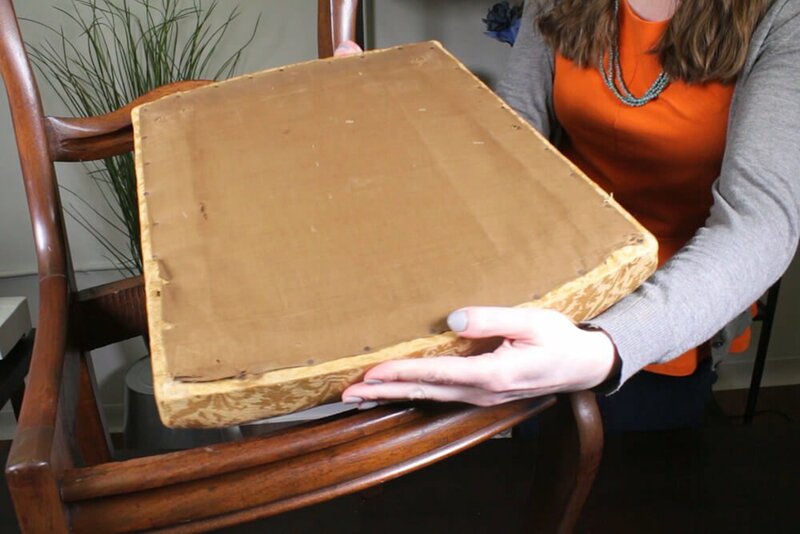 Place the frame on the foam and trace around it. 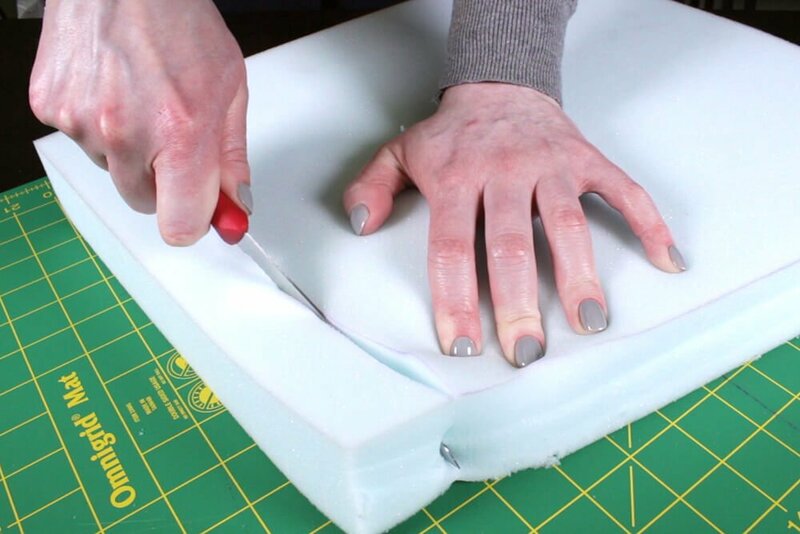 Cut the foam out with an electric or serrated knife. 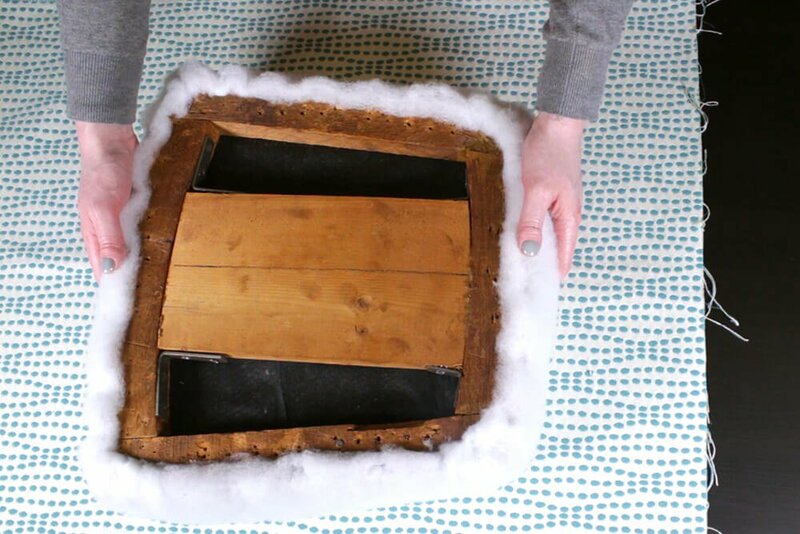 Place the foam and frame face down on the padding. Cut the padding so it wraps onto the bottom about 2” all around. 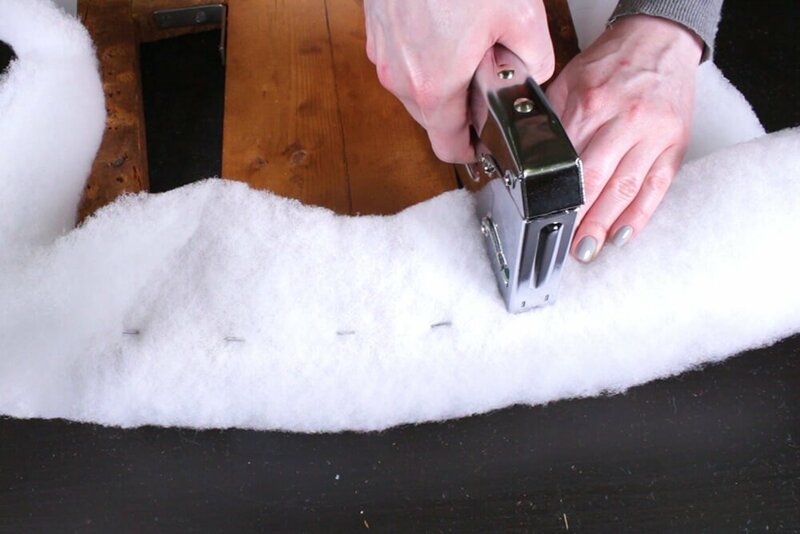 With the staple gun, staple the padding in the middle of all four sides to hold it in place. 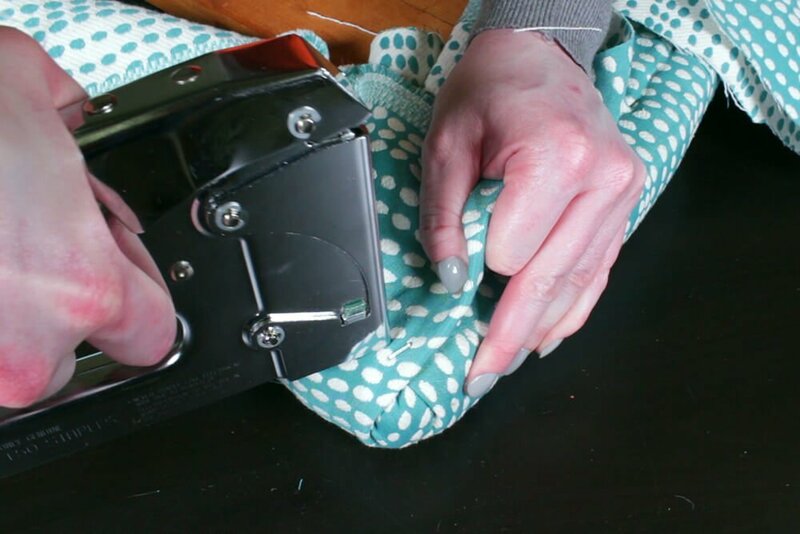 Work your way out from the center staple leaving a little space at the corners. 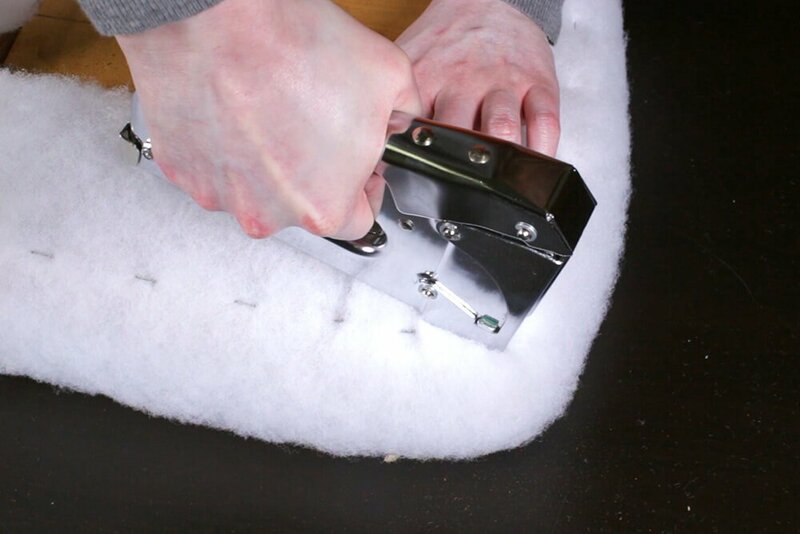 Then repeat on the other sides, pulling the padding taut as you go. 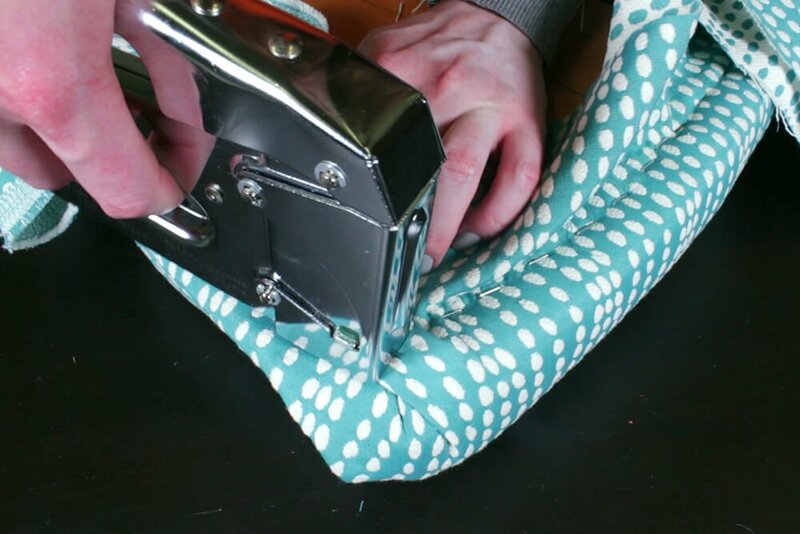 You’ll be using this corner technique for the upholstery fabric as well. 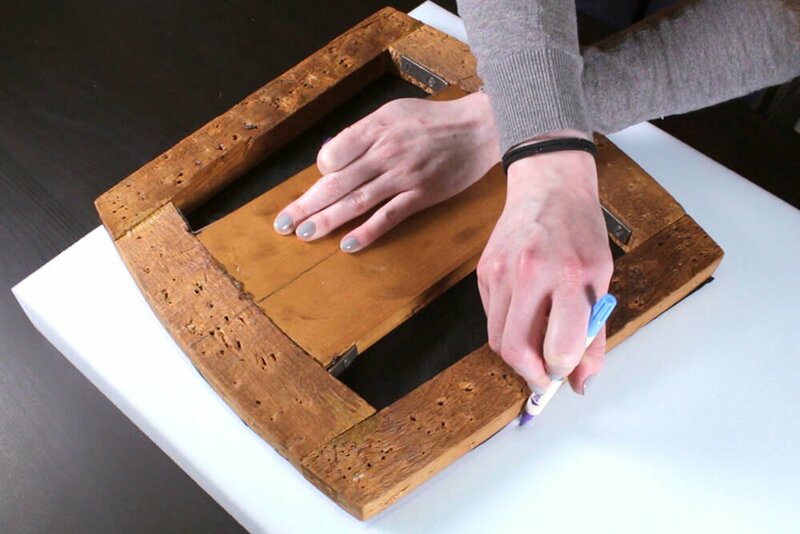 For the corners, pull the padding towards the center of the frame and staple. 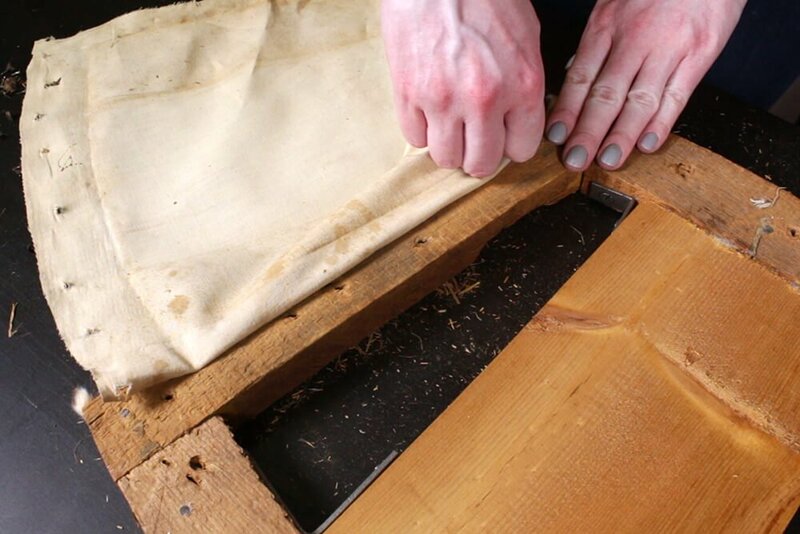 Then staple down the loose padding on either side of the corner. Repeat for the rest of the corners. 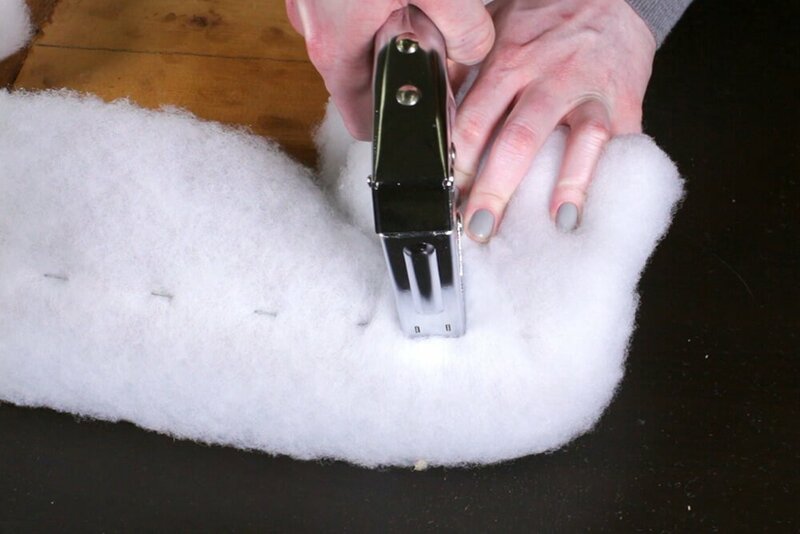 Trim off all the excess padding. Lay the fabric out face down. 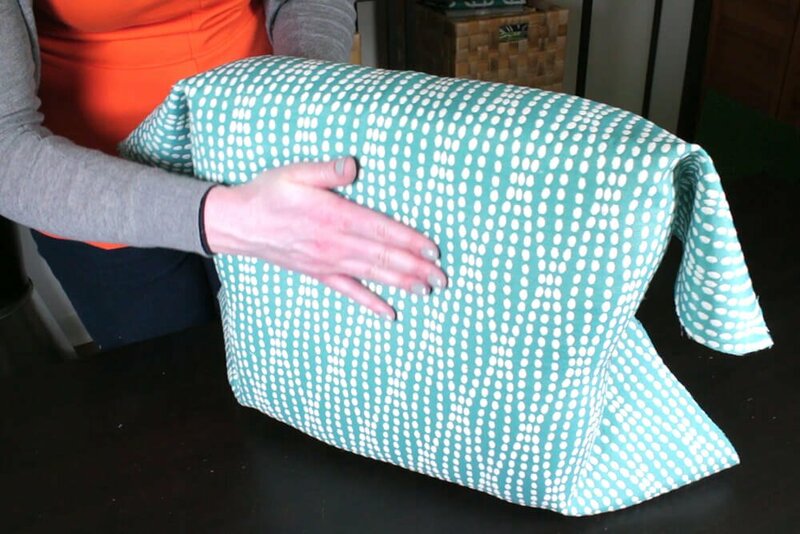 This upholstery fabric is woven, so you’ll see a pattern on both sides, but this predominately teal side is meant to be the front. 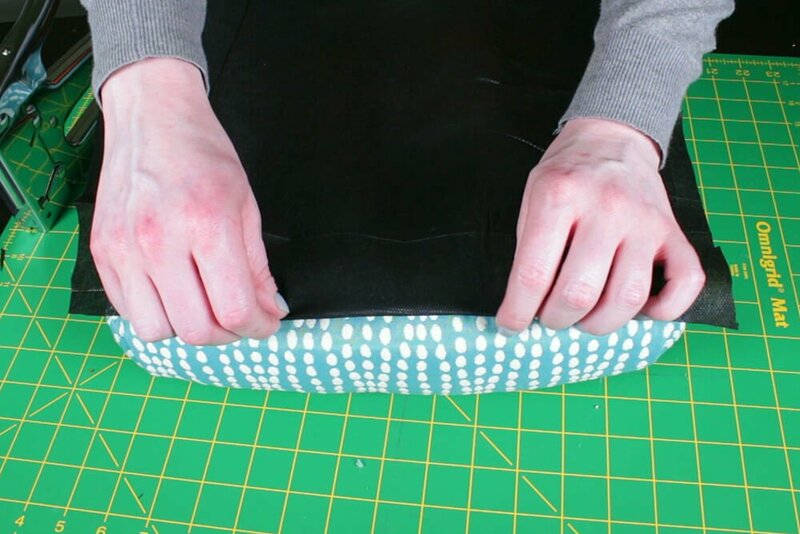 Place the cushion face down on top of it. 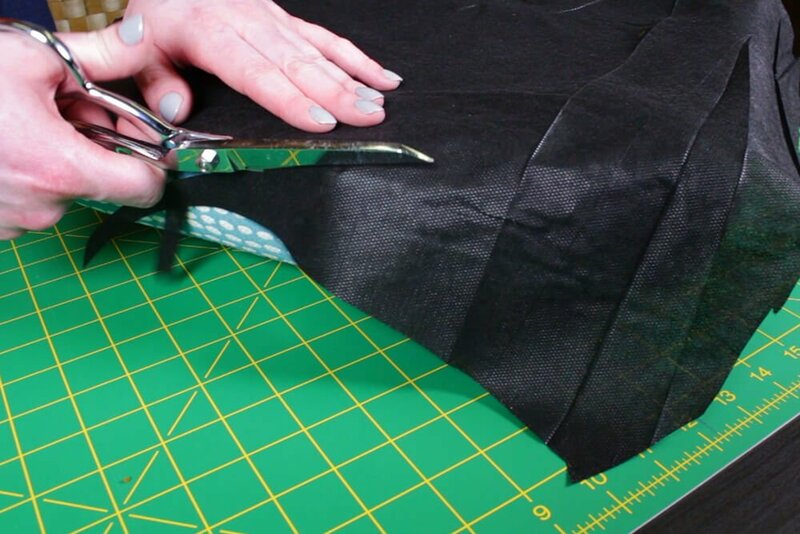 Cut the fabric so there’s an extra 3 or 4 inches to wrap around the back, make sure the pattern is running straight. If your initial center staple is too loose, just remove it and staple again. 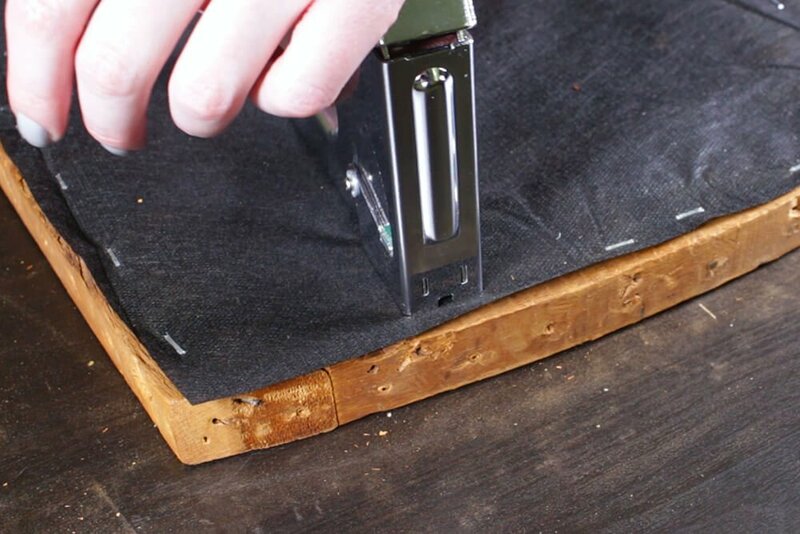 Place a staple in the middle of all 4 sides. On each side, work your way out from the center towards the corners. Leave a few inches at the corners. 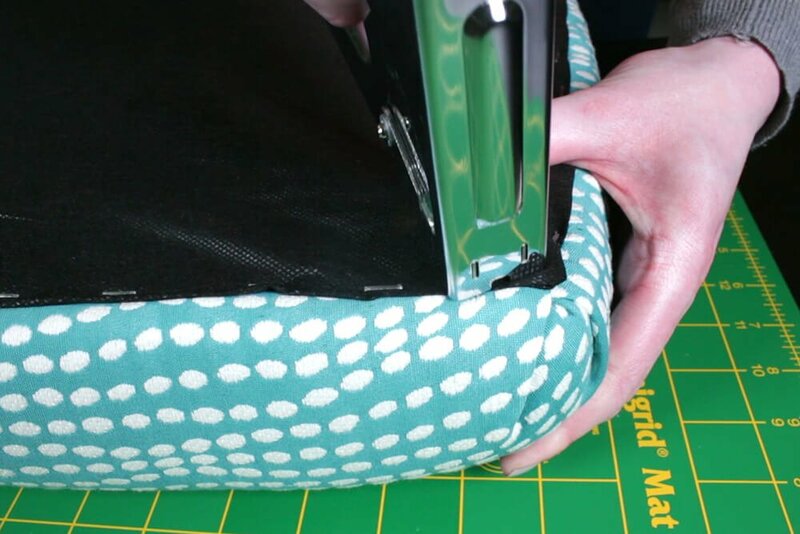 Run your hand over the front as you go to tighten the fabric. 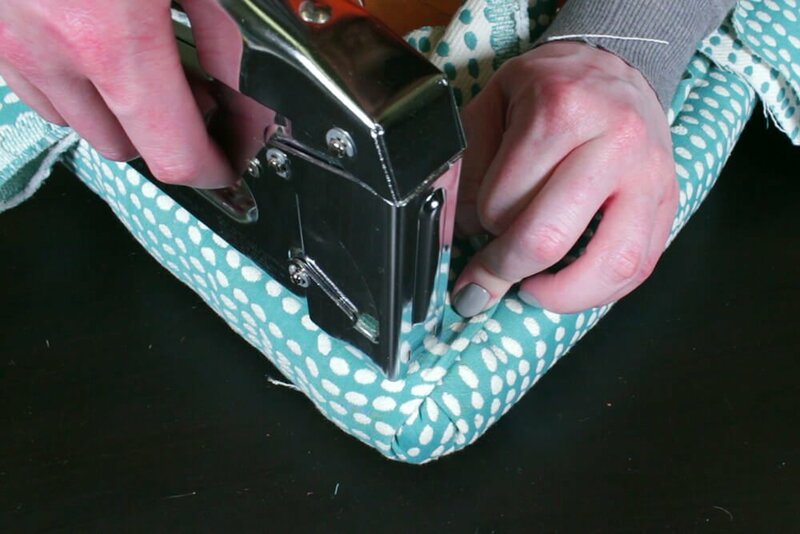 For the corners, pull the center of the corner towards the middle and staple. 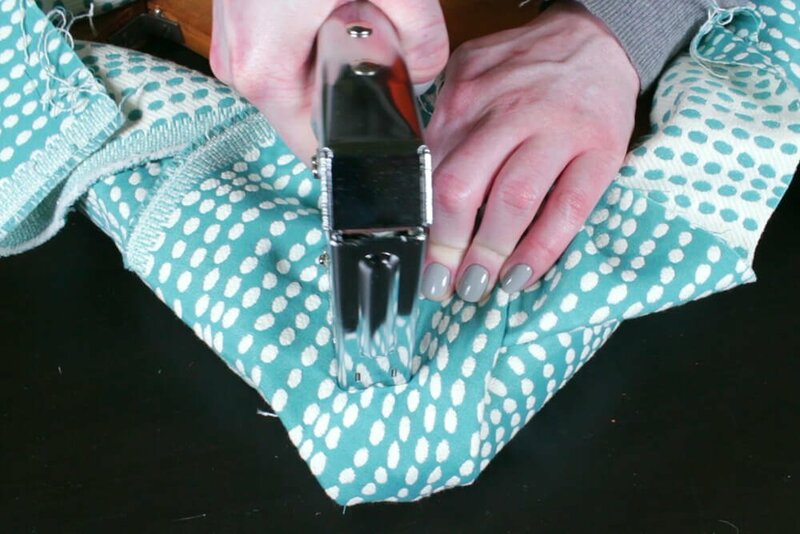 Fold over one edge and staple to form a pleat. Then fold over the other side to form a second pleat. Repeat for all the corners. 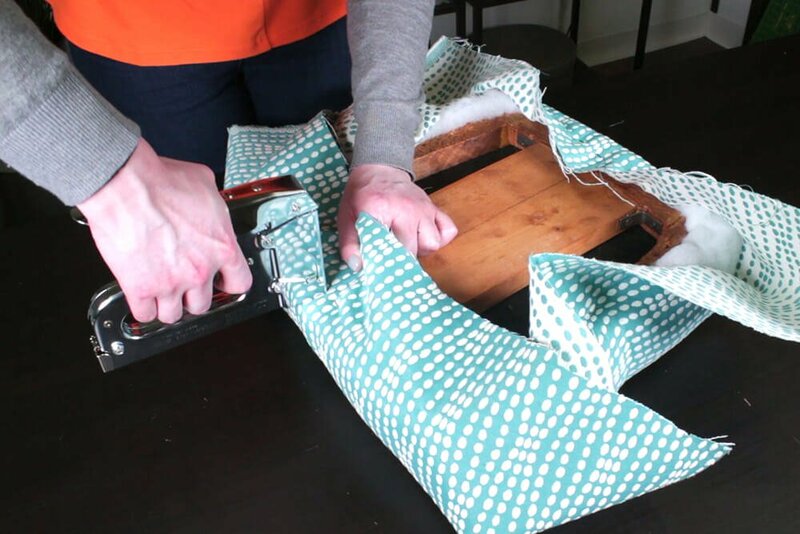 Trim off all the excess fabric. Finally, I’m going to attach the cambric dust cover. This isn’t a necessary step, but it finishes off the bottom nicely. Cut the cambric to the same size as the frame. 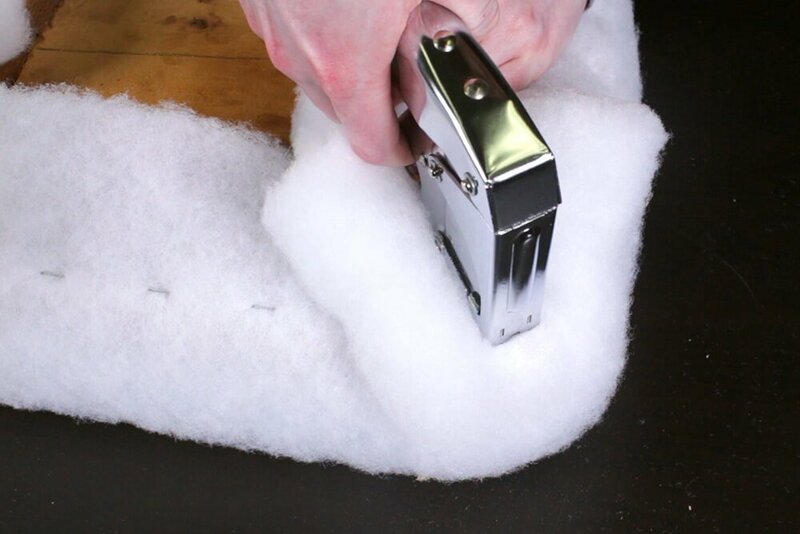 Fold under the edges and staple. 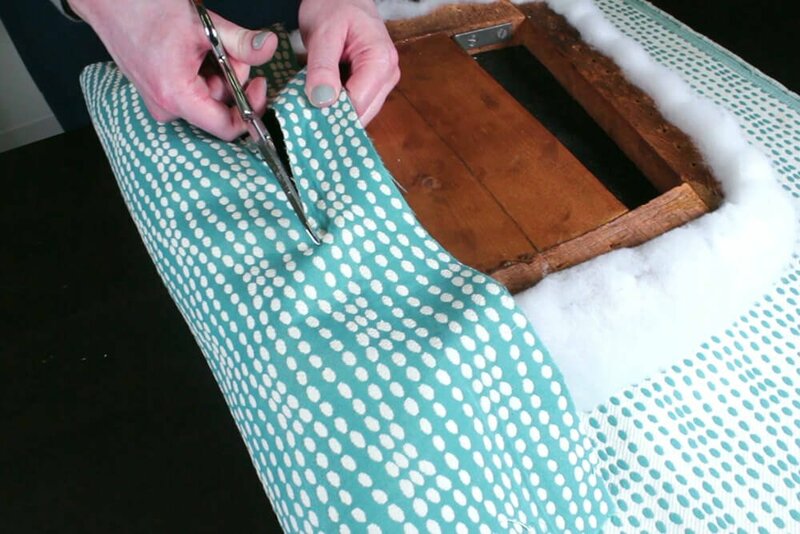 Looking for more beautiful upholstery fabrics? Click this link to view our wide selection! What size staples would be best? BEST ANSWER: Whichever size is recommended for your staple gun. How many yards do I need for six chairs? 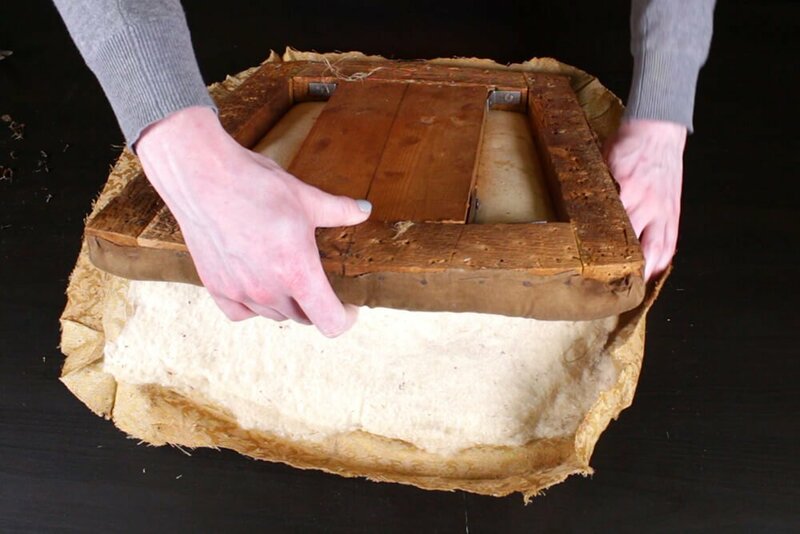 how thick is the foam you are using and is it medium density? How thick is the dacron you are using? 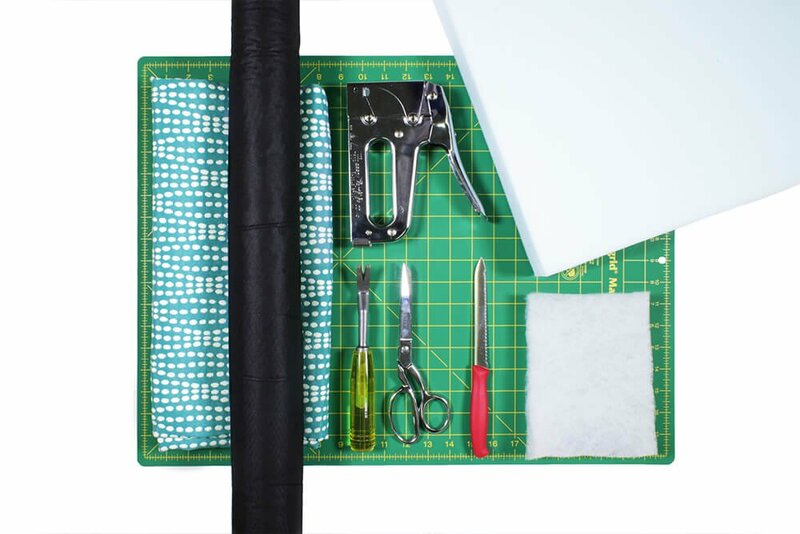 BEST ANSWER: We used the 1/2" dacron padding. 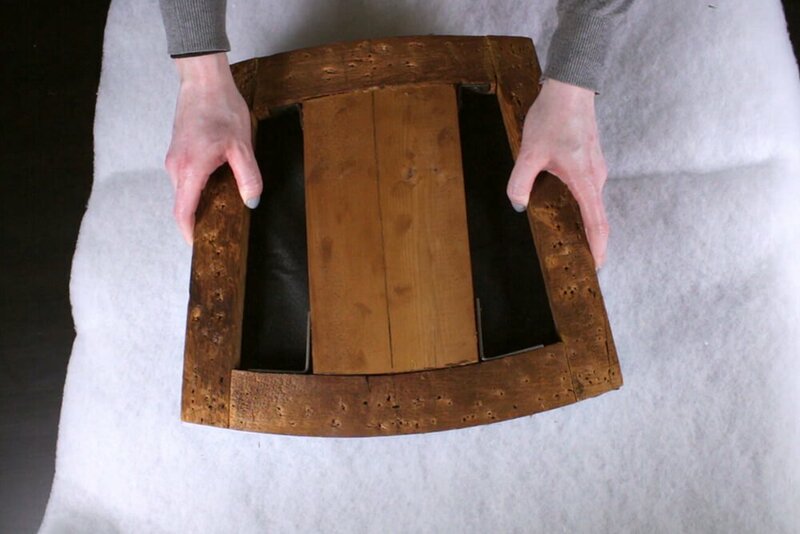 CHAIR SEAT MEASURE 201/2 AT ITS WIDEST POINT HAVE 8 SEATS TO COVER HOW MUCH FABRIC IS NEEDED? Approximately, how many yards of fabric will be needed, on average? 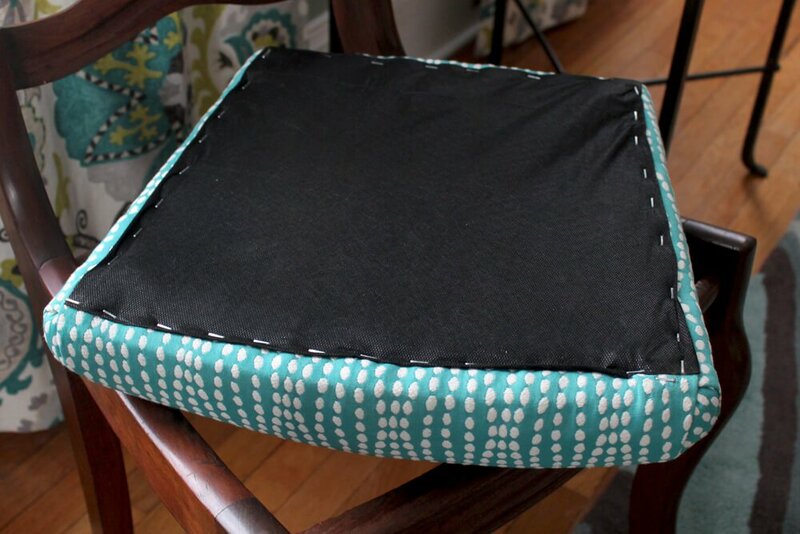 How to cover the back of the dining chair? 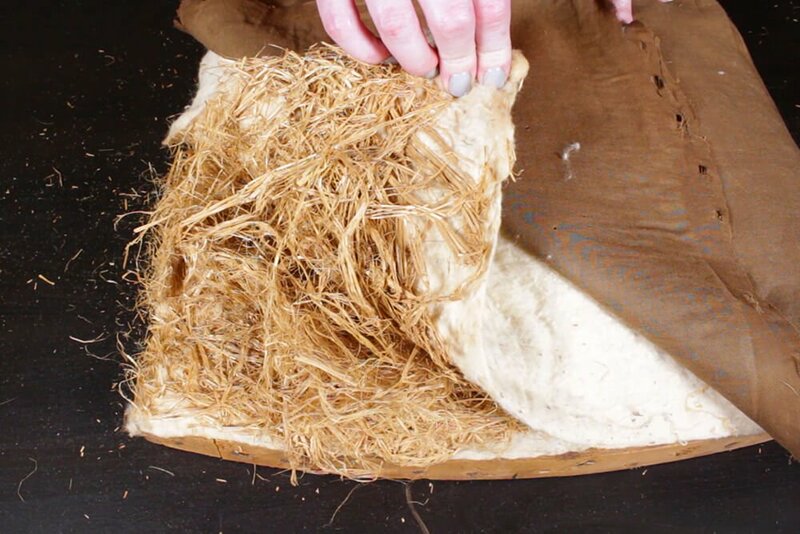 Is there an advantage to using the rubberized horse hair over foam? (The cushions I have taken apart had horsehair).